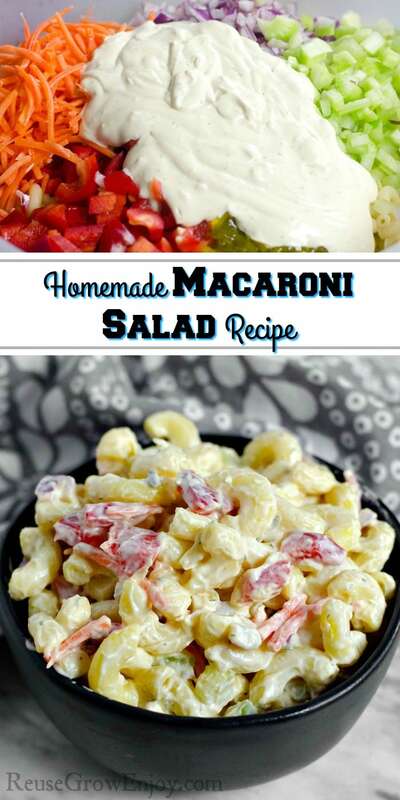 Having a summer cookout or maybe just need an easy side dish for dinner? 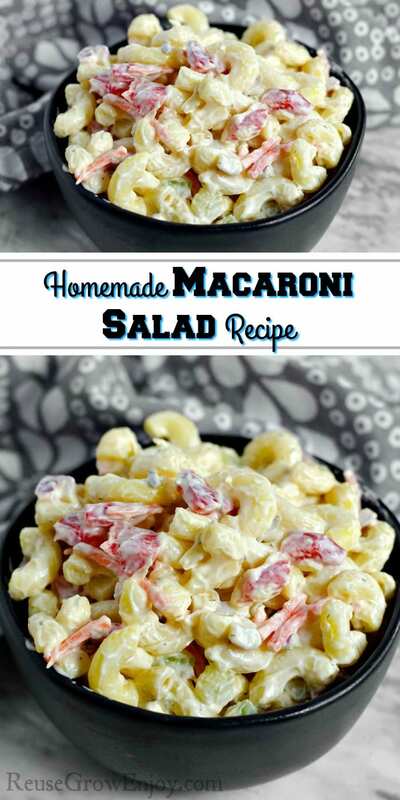 This homemade macaroni salad recipe is easy and delish! It is sure to be a crowd pleaser. 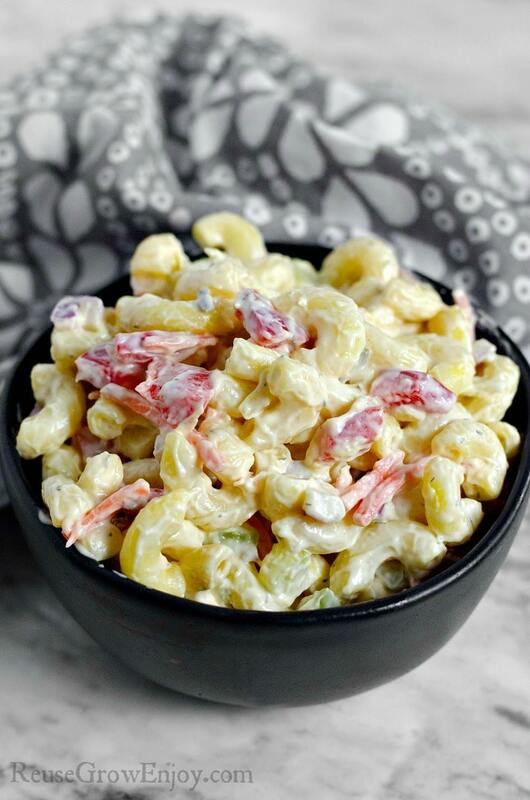 I think macaroni salad is one of my most favorite summer side dishes of all time! 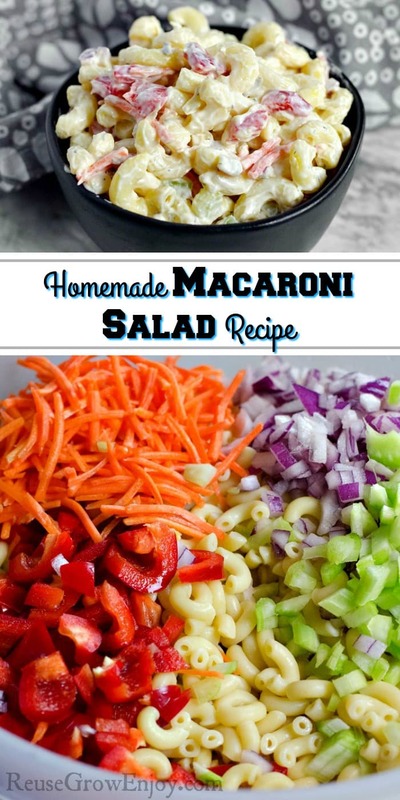 Not only can you make it so many different ways, but it is also a budget-friendly dish too. 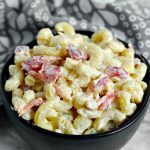 In this recipe we did get a little creative and added in a few items you may not be used to having in macaroni salad but the flavors really do meld together well. However, if there is an item that you really can not stand, such as maybe carrots, feel free to omit them from the recipe. This recipe will yield about eight servings. If you are having a large party, it is very easy to double to make a large batch. For this, we made the pasta on the stove top. But if you could also cook in the Instant Pot or pressure cooker if you wanted. Also, if you are someone that can not have gluten, you can easily swap out the noodles for a gluten free noodle. There are some amazing options out there these days. 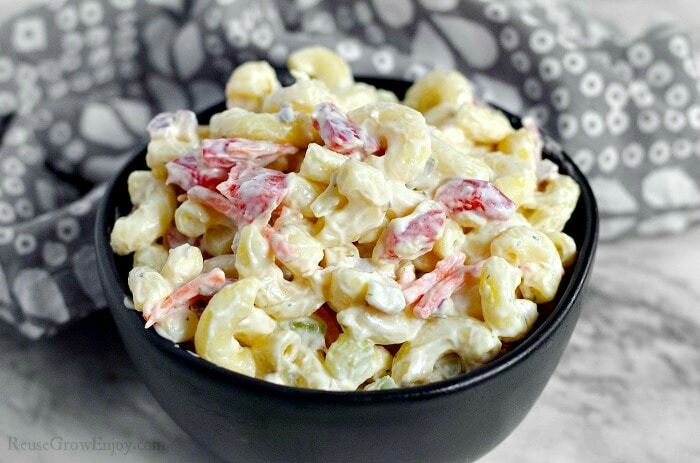 If you are looking for some other great summer dishes, here are a few to try. Boil noodles as directed on package. Rinse with cold water, then drain. 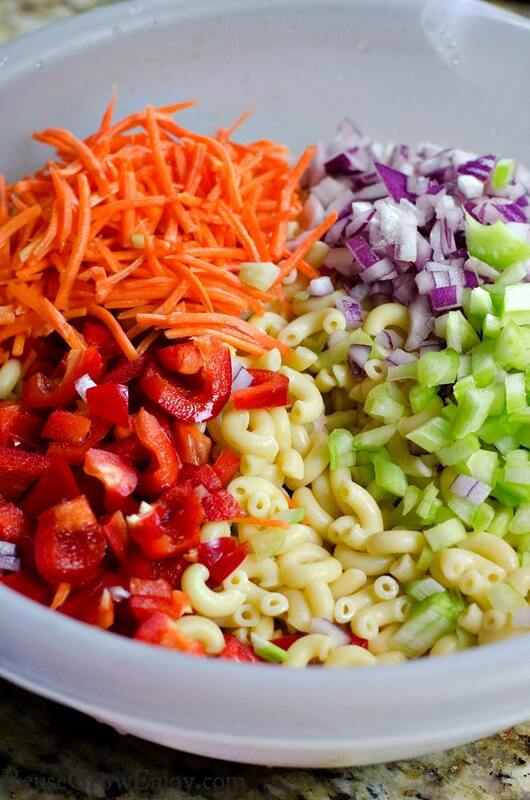 Add celery, red onion, carrots, bell pepper and relish on the noodle in a large bowl. Toss well. 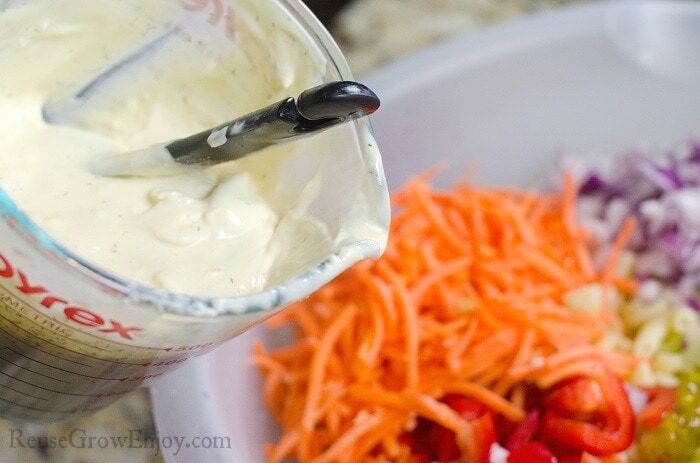 In a small bowl or measuring cup mix together vinegar, mustard, and mayonnaise. Mix well then add in dill, salt, and pepper and make sure it is mixed in. Fold the sauce mixture into the pasta. 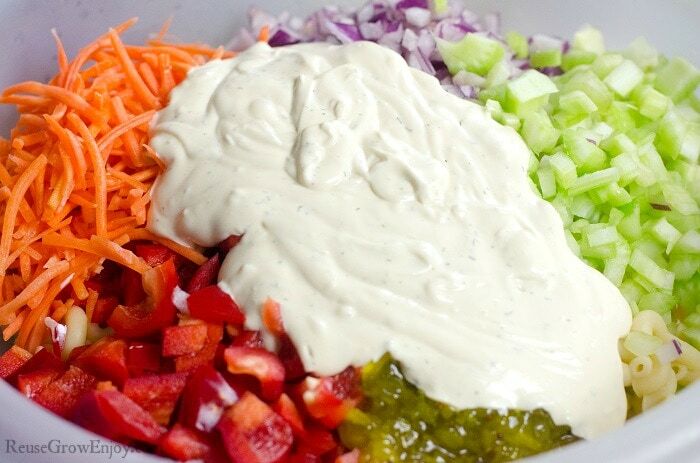 Be sure to coat the salad well. Cover and place in the fridge until ready to serve.